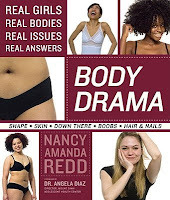 Body Drama: Real Girls, Real Bodies, Real Issues, Real Answers by Nancy Amanda Redd. When Body Drama made the Cybils MG/YA Non-Fiction shortlist, I raced to pick it up and was totally wowed. I opened it tonight, intending to flip through a few pages, but I didn't put it down until I had paged through most of the book. I wish I had had it in high school or college. Nancy Amanda Redd has written a book about girls' bodies that presents the facts in a straightforward, conversational way. Tons of photos of real girls (not models) accompany the text. Do your breasts look strange? Is it normal to have stretch marks? Are you wondering how to curtail unwanted body hair? This book has all the answers and, better still, Ms. Redd doesn't give you preachy advice and stodgy, dry information. Reading this book, I felt like I was sitting down with a trusted friend. Ms. Redd even includes some of her own confessions: a botched wax job, going to a therapist, having people comment on her weight, and more. Besides all the great information and the message that different body types are normal, the photos are invaluable. Be warned: the girls in this book bare it all. Maybe not every parent would be comfortable with that, but personally I think it's a great way to show girls that there are so, so many different body types that are all perfectly normal. Just because your breast or your behind doesn't look like a model's in a magazine, that doesn't mean you're ugly or weird or anything but beautiful. And sometimes things aren't perfectly normal. Body Drama is great about pointing out which differences are normal and which differences merit a call to your doctor. I think Vivian said it best: "Don't let your teens get the wrong information from their friends... let them get empowered with real information and love the body they're in." In my opinion, this book should be required reading for all young women (and because it can be kind of taboo to talk about this stuff, even older women might learn something!). Check out Nancy Amanda Redd's website for information about the author and extras that go with the book. And Happy Non-Fiction Monday! Anastasia's got the roundup over at Picture Book of the Day. Isn't it an amazing book? I wish I would have had it when I was a teen. I remember being totally bowled over when I read this. I'm tempted to buy my own copy. Thanks for a great review! Sounds perfect for our middle school library. Great book. Very accessible and practical. Every family with girls should have it, and I hope someone does a boy version as good as this. Glad you liked this book. I agree it should be required reading. Sydney Taylor Book Award Blog Tour!